Football can be mean, mad, overblown and money-crazed. But it's also a joyfully meaningless passion of the kind we badly need from time-to-time; one which can make us both happier and more human. Saner even... I hope! Anyway, that's why I entitled this piece "Playing fantasy football", in spite of it referencing the dark side. But it came out from The Guardian as: A dystopian league of its own Comment-is-Free, Dec 31 07, 02:30pm: The death of a young footballer puts the big game's myopia into perspective, even if only fleetingly. Well, indeed. I hope the couple of jokes and Dumbarton plugs (naturally) weren't entirely opaque, however. England expects - but which one? According to the rough survey I’ve just conducted, by day two of the news that Italian hardball Fabio Capello had been appointed England manager, the event had already consumed 4,862 column inches in the national papers. Actually, I just made that figure up (77.65 per cent of statistics are invented on the spot), but what it signifies is true enough. There’s a media obsession surrounding the national team coach, and the density of opinion on blogs, phone-ins and email message boards suggests it’s not just journos scratching for a living in the speculation mire. But hang on. Doesn’t everyone involved with English football care deeply about England – unless they have other national allegiances, or peculiar Scottish tendencies like mine? Well, no actually. When the Big Games are on, everyone gets in the mood. But those with greatest enthusiasm for English glory seem to be denizens of the smaller clubs, while fans in the Premier League – especially those affiliated with the Fortunate Four – find it hard to disguise the odd yawn. There are a number of reasons for this. First, while followers of little teams crave the sweet sunlight of success when England take to the field, draping their loyalty on pitch-side banners which spell out Crewe, Doncaster and, er, Exeter City, the Premiership squadrons are tempted to treat this as a bit below their dignity. After all, their teams expect to bank trophies or headlines on a regular basis. Whereas England have won nothing of note since that Triumph which has done as much to atrophy the national spirit since 1966 as it did to boost it to unreasonable proportions at the time. Football tribalism has also, if anything, grown stronger (or at least nastier) in recent years. So it’s a tough call for Boo Boys who have spent their season swearing remorselessly at an opposing player suddenly to switch off the hate taps and start loving him just because he’s wearing an England shirt against Kazakhstan. For those at the other end of the football universe, different rules apply. We may have our heroes and villains in the top flight, but we can rarely muster up that much zeal or bile for them, especially when they’ve donned a white or red national jersey. The same applies in Scotland, where Old Firm rivalry spills awkwardly into international allegiances, but most manage to forgive the gold diggers who headed down south for something sunnier than the SPL. Meanwhile, the debates roll on. What Capello should and shouldn’t do, whether his appointment is a boon or a bane, is a harmless game everyone can enjoy before their eyes roam back to those parts of the sports pages relaying their league team’s fortunes. But woe betide the Italian honcho when the World Cup Qualifiers come round. Then everyone will have an opinion, and anything less than victory will be greeted with crazed scorn and questioning. Not that Capello seems too bothered. “Media criticism, why should I care?”, he has been quoted as saying in the face of onslaughts from the Italian and Spanish press. Those pre-match briefings will be as ruthlessly planned as anything on the pitch. ’Tis the season to be jolly. Well, unless you’re a football fan. We don’t do ‘jolly’, unless we’re that annoying person next door who reckons that everything will take a turn for the better in the next game. The poor, deluded fool. For some of us, ‘the true fans’, it’s even more annoying if the soccer optimist turns out to be (temporarily) right. Because that means we were wrong, even though we obviously know far more about the football grinch. “Huh”, we say to ourselves. “I’ve been around long enough at St James’ Park to know how cruel life really is.” That means if the glass is half full it can only be because some sly wretch filched the other half while I was in the bathroom. Which brings me to the topic of New Year’s Resolutions. Yup, those annual opportunities to turn over a new leaf, be nicer to everybody, remember to turn the central heating off, love the in-laws, sack the boss and ridicule that carthorse in midfield. Oops! I let my guard slip instantly there, didn’t I? It was all going so well on the sweetness and light front until I allowed the thought that Exeter City are not five points clear at the top of the Blue Square Premier to dull my warm-hearted vision, opening up the necessity to find someone to blame. When it comes to blame, there are only ever four candidates. The boss, the players, the fans and the media. Oh, and that guy who says “it could be worse, we could be in the Unibond”. His is definitely the smile of a person who’s just drunk half my beer. No wonder he’s cheerful. My first football resolution of 2008, then, is to stop blaming so easily and start supporting more readily. Instead of fulminating about the sitter our sub’s just missed, I’ll give him the benefit of the doubt. It wasn’t a shot, it was a pass that got deflected by a divot and shows him to be both tactically aware and unselfish. Of course, if he does it again I may have to revise my opinion in the light of evidence… but a lusty shout of “bad luck” is surely better than “you plonker”. Especially as there are others who deserve that far more. No, stop. Accentuate the positives. That’s my new motto. My third resolution involves coming up with shorter, snappier and more sound-bite oriented things to chant from the terraces. By that I don’t mean one word theories of alternative parenthood, either. I’m not quite sure what I do mean, yet. I’m still working on it. Once again, it’s a battle with the negatives, because football wit and wisdom seems invariably to flow downhill toward the morbid observation rather than uphill toward the snowy peak of reason. Which brings me to my last resolution. Only four, but it’s a short column and a long year. I’m dangerously going to suggest we all give up chanting “Argyle are not very good” (or words to that effect). Because they’re three leagues above us. Frankly, it’s not dignified. We should be above such things, as well as higher up the table. Happy New Football Year! 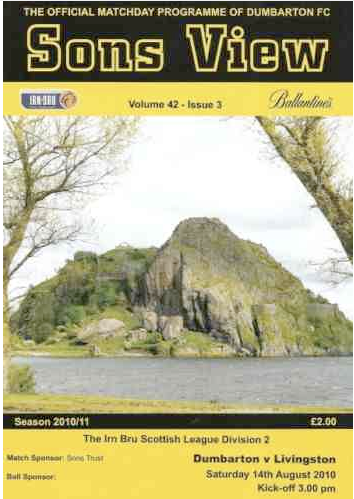 First published in Sons View, 22 December 2007, Dumbarton -v- Montrose. Scottish Football League Division Three. We only sing when we’re winning? Chance would be a fine thing at the Rock this season, given our results so far. But the Season of Goodwill is always ripe for a bit of timely fitba optimism. Here goes, then. The league table might not look quite so pretty as that tree in your living room right now, but the New Year often marks a turn in fortunes for struggling clubs. And while no-one in their right mind would be especially cheery about Gretna’s chances of survival in the SPL come April, the Third Division remains a different proposition. There’s a reason some teams fly and others flounder, of course. But there isn’t that unbridgeable gulf that makes hope and despair a matter of course rather than a seasonable variable. Many of the pundits were predicting a difficult time for the Sons this term, and they haven’t been proved wrong. But I’m still going to stick my neck out and say that we’ll find ourselves on the up come March and April 2008. One of the reasons is the great spirit in the Club. Dumbarton fans can moan with the best of them, naturally. How could we look in the mirror and call ourselves true supporters if we didn’t? But you also don’t get to wear a Sons scarf without being willing to grit your teeth and keep on singing, either. Not that actual singing is my strong suit, I have to admit. When it comes to spectating, I’m more the strong, silent type. I can be seen clenching my seat, emitting a sigh here and there, switching rapidly from momentary elation to, er, friendly advice, and then from time-to-time burying my head in my hands just to make sure it’s still there and I didn’t simply imagine that blatantly ridiculous offside decision. The efforts of the choir don’t go unappreciated, either. Far from it. DFC’s barmy army do the business, for sure. Indeed, football chants remain an undervalued art form. Not just the predictable ones, but those you weren’t expecting, and the finely-honed bits of wit that tell you more about the resilience of a local culture than a gaggle of sociologists ever could. In the surprise category, for me at least, was a lusty rendition of ‘Keep Right On’ greeting Alex McLeish for his recent first home game in charge at Birmingham. Losing Eck for the national team may be a sore point, but the choice of a Scottish song (long Brum’s unofficial anthem) was an acknowledgment that the game down south still owes one hell of a lot to a much smaller nation with, proportionately, a surfeit of footballing passion and wisdom. I haven’t done a scientific survey of this, but outside Glasgow, my guess would be that Merseyside is the place in Britain that’s produced the most glittering examples of terrace tonsil-wagging over the past fifty years – as well as some of the depressing sectarian stuff that still occasionally blights the game, too, it must be admitted. The game that afternoon finished in a resounding Liverpool win, and not just on the pitch. Anfield, as ever, was a cauldron. Until you’ve been on the pitch somewhere like that, players say, it’s easy to dismiss the claim that “the crowd can be a twelfth man” as yet another hoary old football cliché. But sometimes it has been, no doubt. No-one’s likely to turn Strathclyde Homes Stadium into a sporting extension of the Red Army Choir in a hurry, of course. Just as a really large crowd can create its own surging volume pedal, so a much smaller crew can be a bit of a dampener. But getting our vocal chords loudly behind the Sons is still part of what can create a winning atmosphere, as well as keeping spirits up when the going’s tough - Midge Ure, or not, they are the ones. So, to sum up… Sven Goran Eriksson was sure that England would qualify for Euro 2008 under Steve McClaren. Then Plymouth Argyll were convinced they’d hang on to boss Ian Holloway (not much sobbing about that around here, of course!) And at the beginning of the year just about everybody who was anybody in football punditry said that David Beckham’s international career was finished. Definitely. On a less high-profile note, back in the dim-distant-past that is 8 October 2007, I wrote that Blue Square Premier referees were really doing a pretty good job, all things considered, and that we should give them a break. As naturally as a photocopier breakdown precedes a Really Vital Mailing, the official at the Grays game (in which City scraped a 1-0 win) gave, how shall I say, a less than stellar performance. Especially when he failed to act on what looked like a rather blatant last-man offence right near the end. Hey-ho for my programme note. Still, I was pretty confident after our FA Cup performance against a certain Stevenage Borough In November that the Grecians could get a competitive bounce and leap on ahead in the league. We lost 1-4 at home to Burton Albion, our biggest defeat margin for four years. Thank goodness I didn’t mention that one in particular. For today’s game, then, I am definitely keeping schtum. In fact I’m tempted to forecast a disappointing result for City, because even though I’m not at all superstitious, there’s a bit of me that always figures “even thinking it is the kiss of death.” It must be something to do with being a Scotland supporter. In short, if ECFC win this afternoon, it was because I didn’t say we would. If we lose, it’s because I secretly thought we wouldn’t. And if we draw, it’s because the football gods like to toy with our fragile sporting emotions like Georgie Best on the edge of the box. Well, at least I’m certain he won’t score a goal this weekend, bless ’im! The point is, football rests on failed predictions as much as glorious triumphs. That’s how the bookmakers make their money, it’s what makes for the best stories in the papers and on the telly, and it’s what enables each and every one of us entertain the illusion that we really know just as much as the expert at the end of the ether. That the FA will indeed take its time is a dead cert, I’e been telling friends. So knowing my luck, an announcement will have been made not long before you read this – and it will be our own Paul Tisdale heading to Wembley on a garland paid for by Exeweb. Only kiddin’. Actually, ‘Klinsmann for England’, noted in this column weeks ago, is the prediction I’d really like to get right. First, because I nicked it shamelessly off my London flatmate and popular culture guru James Edward Smith. Second, because he’s 16-1 at the time of writing. Third, because both Motty and Franz Beckenbauer would finally have agreed on something. Finally, of course, England needing a German manager to have a serous crack at the World Cup again feels so right in terms of football’s love affair with blatant incongruity. Oh, and I’d have got something right for once. Do You Know the Way to Sign Jose? First published in Sons View, 08 December 2007, Dumbarton -v- Stranraer. Scottish Football League Division Three. “Oh well, you’ll know not to bother next time”, she opined, sweeping triumphantly past me towards an unfinished bowl of washing up that I had been on a pledge to tackle as soon as I got back from the travails down the park. What people who don’t ‘get’ football fail to understand, of course, is that being a fan isn’t about enjoyment alone, it’s about the deeply strange rewards of misery. I mean let’s face it, Dumbarton are without doubt an enhancement to any sane person’s life (cough), but that doesn’t mean we always win or, um, play well, does it? So what would life really be like without its ups and downs, I ask? To which Carla would no doubt reply: “a lot better”. She has a point, frankly, and I’m all for coasting to a 5-0 win as frequently as we can, but there’s something about the struggle with difficult (if not insurmountable) odds that makes the victory even sweeter. That’s probably why I’m just not cut out to be a ‘big team’ supporter. I know more than a few Sons fans also follow an Old Firm team or another comparative giant. It evens up the score in more ways than one, no doubt. But it’s not for me. Well, I’m interested in all aspects of the game, for sure. I also have a passionate desire to see more Scottish teams challenging the Glasgow duopoly. The resurgence of Aberdeen and Dundee United in the 1980s was a great period, and there are some hopes of significant improvement from several SPL teams right now. Hibs have done well, the Dons are giving a good showing in Europe, Killie are up and down, and the Hearts merry-go-round continues. It’s all grist to the game’s emotional appeal. But struggle is still etched into the grain of all those Club stories. Down here in England, the teams I take a passing interest in tend to be lower leaguers too, and mostly relate to great memories or friends’ affections. Chelsea, Man U? They leave me cold. Liverpool have a real, gutsy footballing tradition, of course. The passion of Shanks and his Scottish successors still courses through their supporters’ veins, even as the paella is passed around the dressing room. Then there’s Arsenal. You just have to admire the way they’ve been playing this season (unless there’s been a sudden disastrous dip between me writing this and you reading it, of course!). If I had to pick one of the ‘big four’ to wish luck upon this term, the Gunners would be it. Arsene Wenger is a true ambassador for the game. All that said, it’s the grassroots for me, though. Moments of surprising and sublime skill followed by first-touch gaffes and tactical confusions that have you cheering and despairing in one breath. Plus there’s always the illusion that you really could do a bit better with that corner. It’s not just fan bravado speaking. Well, OK, maybe it is. The point about even a “terrible game” is that it still holds out the hope that next time everything is going to be different. Football is about the lure of another week and another shot on goal, as well as the one that flies in like a dream. As you get older, the memories meld with the weekly fare, too. The Famous DFC have had their moments of glory, and tough they may have been few and far between and we may have missed a number of them personally, they’re all part of what it means to be a Sons fan. That and the fact that we will be back in the SPL competing for a place in Europe within the next four seasons. For sure. You read it first here and I wouldn’t lie to you. Would I? Concerns about the next England football manager seemed light years away when I returned to the game’s grassroots at Heavitree Social United two weeks ago. But thankfully the pitch was in better shape than the one at Wembley during that match against Croatia many would rather forget. It also cost a 500 millionth of the price, according to my calculations. For those who don’t know, your local team’s ground is just behind the Social Club in East Wonford Hill. Admission is a round pound, there’s an all weather wooden stand, and their three sides play in the Devon & Exeter Football League. As Exeter City were away at Histon (I’m a season ticket holder at St James’ Park) I decided to take in a top-half Premiership clash between Heavitree and Clyst Valley on a nippy Saturday afternoon. Games start at 2.15pm at the moment, because there are no floodlights, you’re guaranteed a grandstand view, and you can get back in time for Final Score on BBC1. Having seen off Pinhoe last time, the Heavies were on a bit of a winger and a prayer against Clyst, who wound up 3-0 victors. The wingman in question was 16-year-old Sammy Gedye, whose father Phil, a well-known local painter and decorator, I was standing next to. Sammy was in the middle for the second half, when Heavitree, who had more of the ball before the break but didn’t do much with it, were on the ropes. Some good skill, huge determination, goalmouth scrambles, and one or two random first touches summed up the game. All very different from silly money ‘big time’ football for sure, but great fun, as the 46 people and a dog who saw this would testify. Catch the Heavies at home on 22 December 2007 against Feniton if you can. See you there, perhaps. Talking of which: when I was a kid, growing up in Chiswick and then Kew, my parents had friends with the surname 'Mansfield', which meant that Barrow versus the Stags fixtures became an occasion for friendly rivalry - well, between the two young boys, anyway. Barrow sadly dropped out of the League in 1972, at the expense of Hereford United. 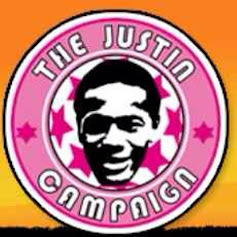 They currently have a supporters' wall project - and as I think of them as my third team, along with Southall, I might contribute. It would give me great pleasure if they could make it back to the Blue Square Premier and full League status eventually, and I really ought to make a trip to Holker Street, Barrow-in-Furness, at some point. Maybe a journey break on the way up to Dumbarton. Meanwhile, Mansfield have secured a 3-2 win against a Harrogate side described as "excellent" by Mark Lawrenson (for once, I agree with him) and are now heading for a Third Round away tie against Brighton (my abode for a few years until 2003). Talking of football at the grassroots, last weekend I took in a game at Heavitree Social United, down the road from me and in the Devon and Exeter League Premier. The whole glorious story ('On a winger and a prayer') is told in the forthcoming issue of the Heavitree & District News. I'll post it here when it's published.